A school in Buckinghamshire has closed following the death of one of its pupils from suspected swine flu. 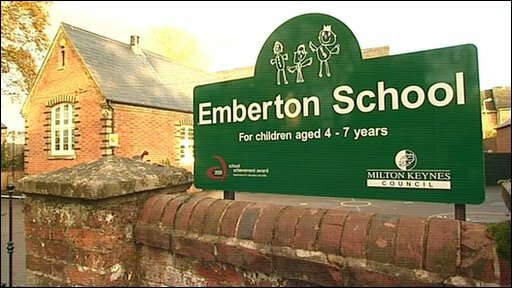 Emberton School, near Olney, which has just 29 pupils, was closed after the five-year-old boy died at Milton Keynes Hospital early on Sunday morning. Tests are being carried out to determine the exact cause of the boy's death. The headteacher at the school, Steve Dunning, told BBC Three Counties Radio the death had come as a great shock. He said said: "The staff of Emberton School are very saddened to learn of the death of one of their pupils who was a confident delightful and happy student and will be missed greatly. "At this time we are focusing on supporting the children and parents in our small village community. "I have spoken directly with the mother and passed on the condolences of all the staff and governors at the school. " On the advice of the Health Protection Agency the school will re-open on Tuesday morning when a special assembly will be held. Deputy director of public health for Milton Keynes, Dr Diane Gray, said: "My sympathies go out to his parents, family and friends. "We don't yet know the cause of this boy's death. At this stage, there is no need to change normal behaviour - you should continue to go to school, work and any social activities."